Alumnus William “The Poet” Langford (’11, College of Arts and Letters)—a modern-day poet, teaching artist, PhD student, and Fulbright scholar—performed the original work, Pamoja (As One), at the Empower Extraordinary campaign celebration on October 19, 2018 at the Breslin Center. The poem, dedicated to campaign donors, conveys a message of unity for Spartans across the globe. When translated from Kiswhili to English, the poem’s title Pamoja means as one. Langford draws inspiration for his creative work from his time in East Africa, and through roots in Detroit and East Lansing. 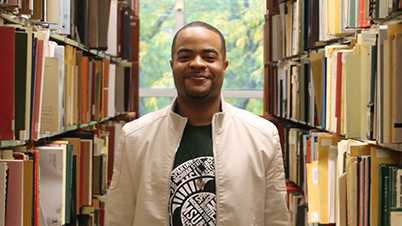 He is the lead language arts instructor for the Michigan State University/Marshall Mathers Foundation project VERSES: Exploring Literacy Through Lyrics and Song. laden with gold and old age. that we would reach back.